I was given an amazing opportunity to try a new product called Soap Time. 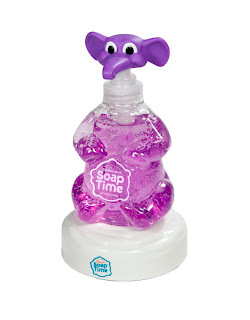 This is a handsoap for children that is awesome. It plays a song for the amount of time that it is suggested a child wash their hands for. 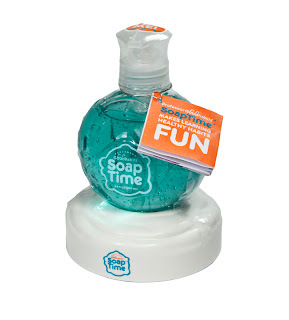 There are three styles of the soap that fit into the base and play a song for 20 seconds. The first type is an elephant. This soap is purple in color and smells like lavendar. All of the songs this elephant sings have to do with animals. There is also a green soap that is shaped like the Earth. This soap smells like green apple and sings songs about the Earth and even counts to ten in Spanish. The third soap was my son's favorite. It is an orange ABC soap. He loves that he can sing the ABC's right along with his soap. My three year old son and I absolutely love these soaps. He was so excited when I showed them to him and immediately picked the orange ABC one to try out. Ever since we have had this soap he washes his hands for at least 40 seconds because he likes to hear at least two songs. Everytime someone new came to our house he immediately brought them into the bathroom to show them his "Special Soap." I was so thrilled with it that I bought two sets at my local Bed Bath & Beyond in Paramus to bring to my sons daycare. I brought one to my three year old's preschool class and the other to my one year old's toddler class. So far it has gotten rave reviews there as well. My only concern and it is very minor is the special note not to submerge the base in water. Being that this is used in the bathroom near the sink I was slightly worried about how resistant it would be to water but so far so good! Mom Select and Soap Time sent me this amazing product to review and are kindly offering a second set of Soap Time for me to do a giveaway. If you are interested in trying this product please leave a comment below by October 2, 2011. Wow cute soap! You do really have a great blog! I love to be here every now and then. anyway i want to invite you to join our new community http://girlstalksociety.com where in you can share your blog posts, create new groups, meet new friends and you can even be a moderator there if you want to, so we can feature your site in the gts spotlight. just do let me know by pm...my username there is prewchatterly. Lets help each others blog have better rankings. by the way this october we will be having our everyday BLOG HOP AND MEME feel free to join in your free time Godbless you! hope to see you there.